CREDITS: Performed for Pres. Obama, Donald Trump, Steve Wozniak, etc. As a senior engineer with Intel Corp. in the late 1990s, Dan Nainan designed and presented highly technical demonstrations on stage with Intel Chairman Andy Grove and other senior executives at high-profile events all over the world. Nainan took a comedy class to help get over the fear of public speaking at these events, at which the audiences numbered in the thousands or sometimes in the millions on television. His first comedy performance at the Punchline in San Francisco was a resounding success, and his coworkers, upon viewing the videotape of that performance, invited him to perform at a team dinner for 200 employees at a computer convention in Las Vegas. Upon seeing that performance, the organizers of Intel's annual sales conference asked Nainan to perform for 2,500 salespeople from around the world. His dead-on impressions of Andy Grove and Bill Clinton had the audience rolling in the aisles at 8 a.m. on a Monday morning. Many in the audience thought that Nainan had been hired as a professional comedian, in what was only his third comedy performance ever. Over the next two years, Nainan performed at various Intel functions, including the company�s annual holiday party, where he was introduced by Dr. Grove himself, whereupon he mimicked the Chairman�s distinctive accent for 20 minutes. 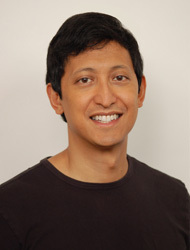 In 2000, Nainan was promoted to Strategic Relations Manager for the East Coast, a position which enabled him to move from Silicon Valley to New York City. Finally, in 2001, he retired from Intel to pursue standup comedy full time. In April of 2003, Nainan won an open mike contest at the Washington, DC Improv, and the prize was a weekend opening for the headliner of his choice. He chose to open for noted HBO comedian Robert Schimmel in November of 2003, and over that weekend he convinced the veteran comedian to let him perform at Schimmel's Honolulu shows. Nainan flew to Honolulu at his own expense, and Schimmel was impressed enough with Nainan's performance to invite the young comedian to tour with him as his feature act in 2004. As a result, Nainan was exposed to some of the top comedy clubs in the country, and Schimmel took him under his wing to teach him about the finer points of the business. In November 2004, Nainan was fortunate enough to be at the New York Improv when Canadian comic sensation Russell Peters headlined, and after Peters' performance, there was extra time available, so Nainan begged to perform. Peters was impressed enough to invite Nainan to tour with him in 2005. Beginning in January of 2005, Nainan and Peters toured both the USA and Canada, performing at theater shows for audiences averaging at least 1000 per show. In April 2005, Nainan both produced the show and performed with Peters at the Apollo Theater, a show which was a complete sellout. Nainan continues to tour with Peters, and the exposure has allowed Nainan to headline his own shows, earning as much as $12,500 per show. A 100% clean comedian, Nainan has performed at charity events, corporate functions, weddings, private parties, colleges and of course at all of the top comedy clubs in the country. He has performed at events with Hillary Clinton, Dr. Sanjay Gupta, Howard Dean and other celebrities, and has performed with noted comedians such as Jerry Seinfeld, Bob Saget and Garry Shandling. He has been seen on NBC's "Last Comic Standing", on A&E, Nickelodeon and on various television commercials. Nainan also does character voices on radio stations all over America, and is best known for his Bill Clinton impression. Nainan is an accomplished musician, having been trained in classical piano since the age of two. He also sings and plays guitar, bass, drums and cello, and in fact plays the cello in �The Hoax�, an upcoming movie with Richard Gere. He is currently working on an album of original music. A world traveler and adventurer, Nainan enjoys learning languages and extreme sports such as bungee jumping, scuba diving, aggressive rollerblading and skydiving. He is also writing a computer book. An early riser, Nainan eschews the bar scene, preferring instead to focus on creative and athletic pursuits. He does not own a television, and he does not drink, smoke, or do drugs, and never has.